This is my new favourite dessert! I chose to use Royal Gala apples for this recipe because they are naturally very sweet, so it doesn't require much added sugar to achieve sweetness. This dessert can be made gluten free by purchasing gluten free oats. Oats are gluten free, but cross contamination is common during packaging. If you are sensitive to gluten, be sure to look for gluten free on the label (such as Bob's Red Mill). Funny thing, I forgot to add the sugar when I made this batch, but adding it later actually turned out better than my previous batch! Sugar has a very low burning point, so by adding it with 30 minutes of cooking time to go, it prevented the sides of the pot from overcooking. Also, I couldn't bring myself to throw out all the apple peels (so much fibre to miss out on!) so I ate five apples worth of peels after I prepared this! Feel free to skip that step (haha). Grease the bottom and sides of the slow cooker insert. Peel the apples and cut into wedges, then cut the wedges in half to make bite sized chunks and place evenly in the slow cooker. Melt butter in microwave for 30s and pour into mixing bowl. Add ground almonds to butter and mix with a fork until almonds are coated. Add oats, cinnamon and nutmeg and mix until uniform. Pour the mix evenly over the apples. Turn the slow cooker on high for 2 hours. 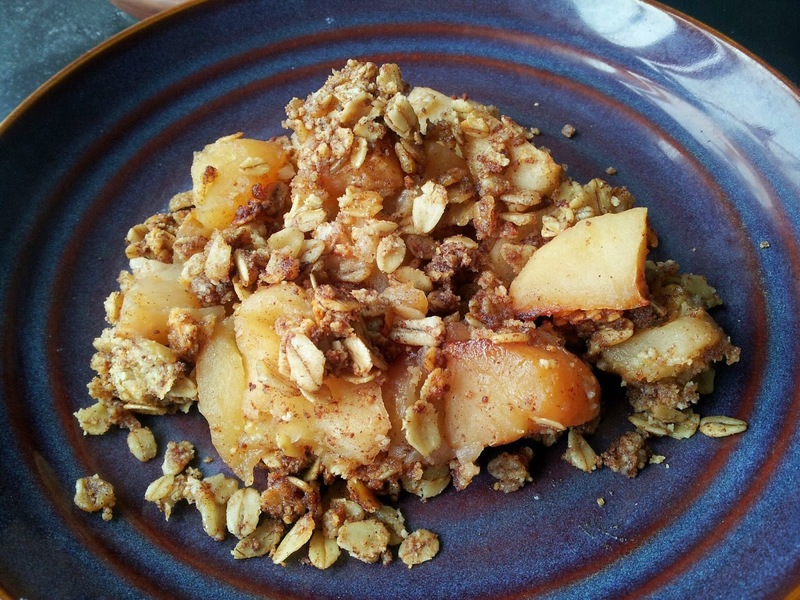 After 1.5 hours, remove the lid from the slow cooker and evenly pour sugar over top of the apples and oat mix. Replace lid and cook for the remaining 30 minutes. Allow to cool slightly before serving.